It's not often that a laptop will get everything right when it comes to media playing. It might have a fantastic screen, for example, but the speakers could be inadequate, especially if you want to get the most out of Blu-ray's DTS HD and Dolby HD goodness. Setting up Windows 7 Home Premium with a username, time zone and connecting it to a wireless network – plus setting when to automatically update Windows – is a necessary step, but after all that it was frustrating – to put it mildly – to be faced with another set of installation steps – this time for HP's own Total Care service. All it does is end up delaying you from what you really want to do – which is to get started with your brand new laptop. Another thing that annoyed us was that if you don't want updates from HP Support Assistant, or for your laptop to be tuned up automatically, you can't just select 'No' but have to choose 'No, remind me later'. Even if you're not interested in the service, you're going to be nagged about it in the future. In the grand scheme of things this is a small irritant: once you've finished the setup process you won't have to worry about it again, apart from the odd reminder. Finally, we can enthuse about the dv7-6b51ea's media prowess. For a start the 17.3 inch LED screen looks amazing, with a not inconsiderable 1600 x 900 maximum resolution. As you'd expect from an LED screen, colours and contrasts are brilliantly reproduced and high definition media looks great – just as well considering the HP Pavilion dv7-6b51ea features a Blu-ray drive. All good so far, but what about the Achilles' heel of so many laptops – the speakers? Once again the dv7-6b51ea triumphs thanks to HP's partnership with Beats Audio, resulting in some excellent compact speakers that sound amazing. Little details in our test Blu-ray's soundtrack were picked up and reproduced perfectly. There is even a built-in subwoofer on the base of the laptop that gives low frequency sounds a real depth and impact. While the AMD Radeon HD 6490 graphics card is no slouch, it's not quite powerful enough for the latest games, but for the odd less-demanding game it'll cope pretty well. Also the 8GB of RAM supplied is huge and means almost all tasks will open and run smoothly, whilst multitasking won't be a problem at all. Whilst running a Blu-ray movie we had Skype running and Internet Explorer open on a number of websites, and the HP Pavilion dv7-6b51ea didn't miss a beat. At 3.45kg it's not very portable, and it's nowhere near as thin or light as the latest Ultrabooks. Next to the power button is the 'web' button. When we first saw this we excitedly thought it could be for booting into a light Linux operating system designed solely for browsing the web – as found on a lot of Sony VAIO laptops. However, all it does is open up the default web browser when in Windows 7. It's a feature that manages to be handy and a little bit useless all at once. Also, at first glance it appeared that the HP Pavilion dv7-6b51ea didn't have any USB 3.0 ports, with the familiar blue colour code missing from all of the USB ports. 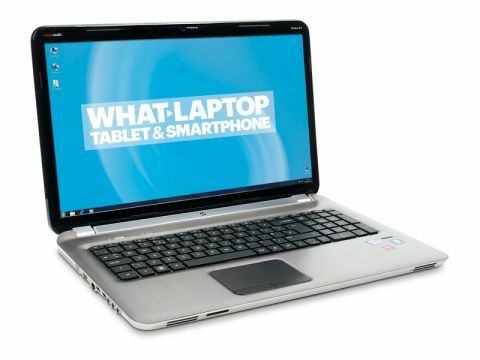 This couldn't be right, not in 2012 with a laptop just shy of £1000. We checked the specs, and indeed there are USB 3.0 ports. On closer inspection the two USB 3.0 ports were on the left of the laptop's case. Not highlighted by blue, but with a subtle 'SS' next to the USB icons. Again not a big problem, but it makes it a little harder to find the USB 3.0 ports in a hurry. Also as a laptop positioning itself as an ultimate entertainment laptop, there is no 3D support. If you're not too into 3D then this won't be a problem, and the lack of 3D helps keep the price south of £1000, but if you want a laptop that can handle the latest media, while future-proofed, then the absence 3D out of the box could be a blow.